ZhongDe Waste Technology AG is committed to the principles of good and responsible Corporate Governance. Corporate Governance at ZhongDe is focused on responsible long-term value creation and is based on the German Corporate Governance Code (Deutscher Corporate Governance Kodex). Since its implementation in 2002, the German Corporate Governance Code, along with the statutory provisions of law, proved itself as benchmark for good Corporate Governance in Germany. Executive Board and Supervisory Board of ZhongDe Waste Technology AG therefore explicitly support the German Corporate Governance Code and its objectives. The following Executive Board’s declaration on corporate governance pursuant to section 289a of the German Commercial Code (HGB) forms part of the combined management report. In accordance with section 3.10 of the German Corporate Governance Code, the declaration on corporate governance also contains the corporate governance report. Contrary to section 3.10 of the Code, the Executive Board and the Supervisory Board did not report on Corporate Governance in 2017, as the annual report in which the declaration on corporate governance containing this report is published will be published delayed in the year 2018. With regard to the financial year 2016, the Company is therefore complying with this recommendation delayed. According to section 4.1.3 sentence 2 of the Code the Executive Board shall implement a Compliance Management System whose main features shall be published. Section 4.1.3 sentence 3 of the Code recommends to grant to employees the possibility to notify protectedly infringements of law in the Company. Due to the fact that this recommendation became just recently effective, the Company does not comply with this recommendation yet but will implement respective measures in the future. Section 4.2.1 sentence 1 of the Code recommends that the executive board shall be comprised of several persons. Since the former Chief Financial Officer, Mr. William Jiuhua Wang, resigned from his office on 9 June 2016, the Executive Board is only composed of the chairman Mr. Zefeng Chen. The Supervisory Board is looking for a qualified candidate for the position as CFO since the resignation of Mr. Wang, but has not succeeded so far. One candidate already worked for three month for the Company, but his performance did not meet the expectations of the Company. Thus, the Executive Board is temporarily composed of only one person. Another person, a woman, is specifically envisaged, but has not been appointed yet. Sections 4.2.2 and 4.2.3 of the Code contain recommendations on the remuneration of members of the executive board granted by the company. Since Mr. Zefeng Chen has only signed a service agreement with a Chinese subsidiary, but not with the stock corporation itself, and since the service agreement only contains a fixed remuneration, the recommendations set forth in sections 4.2.2 and 4.2.3 of the Code do not apply insofar. The Supervisory Board is of the opinion that Mr. Chen already has a strong interest in a sustainable growth of the Company due to his significant shareholding in the Company, so that there is no need for further monetary incentives. From June 2014 until his resignation in June 2016 a service agreement with Mr. William Jiuhua Wang existed which contained a fixed remuneration and a variable remuneration component in the form of an annual bonus, the granting and amount (up to a contractually defined cap) of which is in the sole and free discretion of the Supervisory Board. The remuneration of Mr. Wang is generally in line with the recommendations set forth in sections 4.2.2 and 4.2.3 of the Code. The variable remuneration in the form of a discretionary bonus does however, insofar deviate from the recommendations set forth in section 4.2.3 para. 2 sentences 7 and 8 of the Code as the parameters or targets, respectively, are not defined in advance. The Supervisory Board is of the opinion that the variable remuneration in the form of a discretionary bonus was advantageous for the Company as it allowed the Supervisory Board to judge the performance of Mr. Wang holistically from an ex post perspective and further allowed to take into account other developments such as the general standing of the Company. Section 5.1.2 para. 2 sentence 3 and section 5.4.1 para. 2 sentence 1 of the Code recommend to determine age limits for the members of the Executive Board and the Supervisory Board. The Company has not determined such age limit and so maintains the option to appoint members of the Executive Board or the Supervisory Board that have already crossed a certain age limit on a case by case basis. The Company believes that the determination of an age limit is not useful as a general rule but rather prefers the qualification and experience of its board members as criteria. Section 5.3 of the Code recommends the formation of committees of the Supervisory Board. The Company did not establish any Supervisory Board committees. The Supervisory Board of the Company is only composed of three members. According to the regulations for German Stock Corporations a committee of the Supervisory Board needs to consist of at least three members to constitute a quorum. Therefore, the establishment of committees does at the moment not promise any advantages. According to section 5.4.1 para. 2, sentence 1 of the Code, the Supervisory Board shall prepare a profile of skills and expertise for the composition of the entire Supervisory Board. Due to the fact that this recommendation was included in the Code and became valid recently, a competence profile has not yet been prepared, but will be prepared by the Supervisory Board soon. According to section 5.4.1 para. 2 of the Code, the supervisory board shall take into account a general time limit for an engagement in the Supervisory Board. Although the Supervisory Board will generally take into account the recommendations of the Code when discussing proposals for engagement of new members or proposals for re-election they are of the opinion that Supervisory Board members should be allowed to continue their work for the group, if this serves best for the progress of ZhongDe and therefore refuses to determine a maximum time period for a membership in the Supervisory Board. Section 5.4.1 para. 5 of the Code recommends to attach the CVs of the candidate for Supervisory Board elections to the proposal of the Supervisory Board, which inform about relevant knowledge, skills and experiences and which – complemented by an overview of the main working activities of the Supervisory Board members besides their office in the Company – will be updated every year on the website of the Company. With regard to the coming election of Supervisory Board members at the annual general meeting this year the Company will attach the required CVs to the proposals for the election. In the future the Company will publish the complemented and yearly updated CVs on its website. According to section 5.4.6 para. 1 of the Code, the remuneration of the supervisory board members shall take into account the chairmanship and deputy chairmanship in the supervisory board as well as the chairmanship and membership in supervisory board committees. The current regulations on the remuneration of the Supervisory Board members only take into account the chairmanship in the Supervisory Board. In the view of the Company, an increased remuneration for the deputy chairman is not indicated as the tasks are primarily fulfilled by the chairman of the Supervisory Board. Supervisory Board committees have not been established due to the small size of the Supervisory Board so that the membership or chairmanship in committees are not to be considered for the determination of the remuneration. According to section 5.4.6 para. 2 of the Code, in case the supervisory board remuneration contains a variable component, such variable component shall be directed towards a sustainable development of the company. The variable remuneration of the Company's Supervisory Board is based on the annual profit per share, which in the view of the Company is generally a reasonable indicator for the Company's – and thus also the Supervisory Board's – performance. However, the variable component is not specifically based on a long-term indicator and thus, the variable remuneration may not meet the recommendation set forth in the revised section 5.4.6. para. 2 of the Code. According to section 6.2 of the Code the corporation shall disclose in a “financial calendar” on its website, giving sufficient advance notice, the publication dates of the annual reports and interim financial information as well as the dates of the general meeting. Due to time-consuming discussions with the auditors about the annual financial statement 2016 it was unclear for a long time at which time the annual financial statement would be completed and published, the dates of publication of the annual report 2016 and the interim financial reports based on the 2016 annual financial statements were not published sufficiently in advance. The same applies to the date of the upcoming general meeting. In the future, the Company will again announce such dates on its website giving sufficient advance notice. Section 7.1.2 of the Code recommends the annual consolidated financial statement and the group management report to be made available to the public domain within 90 days from the end of the financial year, and to make available the interim financial information within 45 days after the end of the respective reporting period. By now, the Company has missed these timelines. The reason is that due to its international holding structure and higher translation efforts to be made in respect of the preparation of the financial reports, the Company has put and will put more emphasis on accurate financial statements rather than to exactly meet the recommended timelines. The shareholders exercise their rights and voting rights at the general shareholders' meeting (Hauptversammlung). Each share grants one vote in the general shareholders' meeting. Shares conferring multiple voting rights or limited voting rights or preferred shares do not exist. The shareholders are entitled to exercise their voting rights in the general shareholders' meetings in person or by proxy, for which they can authorise a representative of their choice or a company-nominated proxy acting on their instructions. The invitation for the general shareholders' meetings includes explanations on the provisions on the attendance, the procedure pertaining to the exercise of voting rights (in person or by proxy) as well as the rights of the shareholders. All reports and documents which are required by law to be made available for general shareholders' meetings, including the annual report, will be published on the Company's website at www.zhongde-ag.com/investor_relations/hauptversammlung.html together with the agenda. After completion of the general shareholders' meeting, the actual quorum and the voting results will also be published on said website. In accordance with statutory requirements, ZhongDe Waste Technology AG has a so-called two-tier governance system which is characterised by the Executive Board and the Supervisory Board being two separate and independent governing bodies. The Executive Board and the Supervisory Board work closely together in the interest of the Company. Their common goal is to ensure the continued existence of the Company and its sustainable growth. The members of the Executive Board are appointed by the Supervisory Board, which also determines the number of the members of the Executive Board. Currently, the Executive Board of ZhongDe Waste Technology AG consists of one member, Mr. Zefeng Chen (Chief Executive Officer) after the Chief Financial Officer Mr. William Jiuhua Wang resigned from his office in June 2016. The Supervisory Board is composed in accordance with sections 95 and 96 of the German Stock Corporation Act (Aktiengesetz) and consists of three members. The current members of the Supervisory Board are Mr. Prof. Chuantong Li (Chairman), Mr. Triomphe Zheng Lin (Deputy Chairman) and Ms. Li Zhuang. All of them were appointed as members of the Supervisory Board with immediate effect by decision of the regional court of Frankfurt/Main dated 24 October 2016. The members appointed by the court will be proposed to be duly appointed as members of the Supervisory Board by the next general shareholders' meeting. The Executive Board is responsible for managing the Company, developing the Company's strategy, agreeing this strategy with the Supervisory Board and implementing it. This includes the steering of the group, the management and investment policy pertaining to the financial resources, the development of personnel strategy, the recruitment of key employees and the presentation of ZhongDe Group to the capital market and the public domain. The Executive Board is obliged to inform the Supervisory Board continuously, timely and comprehensively on all matters which are relevant for ZhongDe Group. In urgent cases, it has to immediately inform the chairman of the Supervisory Board. For certain business transactions and measures as more specifically set forth in the by-laws for the Executive Board, the Executive Board requires the Supervisory Board's prior approval. The members of the Executive Board are obliged to disclose conflicts of interest to the Supervisory Board. The Supervisory Board has to report on any conflicts of interest to the shareholders. In the financial year 2016, no conflicts of interest that would have had to be disclosed and/or reported to the Supervisory Board occurred. By resolution dated 8 September 2015, the Executive Board has determined objectives for the composition of the senior management team at the Company. Pursuant to these objectives, the Executive Board has set the objective that 30% of the Company's senior management team shall be women. The main task of the Supervisory Board is to control and advise the Executive Board, the decision on the approval of business transactions requiring the Supervisory Board's prior approval as well as the review and approval of the annual financial statements of the Company. The Supervisory Board is furthermore responsible for the appointment of the members of the Executive Board and the determination of their remuneration. The Executive Board provides the Supervisory Board with regular reports and updates on business policy and all issues of relevance for the ZhongDe Group relating to the strategy, planning, business development, the risk situation and the risk management system. The reports of the Executive Board also include the subject of compliance, i.e. the implemented means through which adherence to statutory provisions and ZhongDe Group's internal statutes is ensured. The members of the Supervisory Board are obliged to disclose conflicts of interest to the Supervisory Board. The Supervisory Board has to report on any conflicts of interest to the shareholders. In the financial year 2016, no conflicts of interest that would have had to be disclosed and/or reported occurred. Pursuant to section 5.4.1 of the German Corporate Governance Code, the Supervisory Board has to be composed of members being in command of all required skills, qualifications and experience required for the performance of its duties. The Supervisory Board believes to be composed in accordance with these requirements. Its chairman as professor in science and engineering is experienced in the areas waste management and waste industry, especially in China, as well as in the field of new and renewable energy technologies. Therefore, he is qualified to advise and supervise the Executive Board in all matters relating to the Company's technology. Mr. Triomphe Zheng Lin is financial adviser and accountant and is qualified and experienced in the area of business financing as well as risk management, international accounting and consulting. Furthermore, Mr. Lin's particular expertise is with Chinese companies. Ms. Li Zhuang due to her educational background and her professional experience is particularly qualified in marketing and leading operation departments. According to section 5.4.1 para. 2 of the German Corporate Governance Code, the Supervisory Board shall specify concrete objectives regarding its composition and shall prepare a profile of skills and expertise for the entire Board. For its composition it shall consider appropriately the specifics of the enterprise, take into account the international activities of the enterprise, potential conflicts of interests and independence of its members, an age limit to be specified for the members of the Supervisory Board and diversity. These concrete objectives shall, in particular, stipulate an appropriate degree of female representation. The Supervisory Board thoroughly dealt with these recommendations. It complies with the requirement regarding the representation of women, and is of the opinion that it also complies with the requirements concerning independence and potential conflicts of interest. Potential conflicts of interests are prevented by the fact that all members of the Supervisory Board are independent within the meaning of section 5.4.2 of the German Corporate Governance Code. The international operations of the Company primarily comprise Germany and China. Accordingly, the members of the Supervisory Board are of Chinese origin and due to the Australian citizenship of one member of the Supervisory Board, the internationality is taken into account adequately. In addition, one member of the Supervisory Board has outstanding knowledge of German. The Supervisory Board intends – while securing the qualification and experience of its board members – to secure this diversity and independence of its members in the future. On 7 September 2015 the Supervisory Board unanimously adopted a resolution by which it has determined that after the next election of the members of the Supervisory Board the Supervisory Board shall be composed of at least one female member. To achieve this objective Ms. Zhuang will be proposed to be appointed by the general shareholders' meetings. Respectively, the Supervisory Board has decided that by 30 June 2017 also the Executive Board should be composed by one female member out of at most totally three members. The Supervisory Board is still seeking for qualified candidates for the Executive Board, particularly to substitute the former Chief Financial Officer Mr. Wang who resigned from his office. Neither the Executive Board nor the Supervisory Board has established any committees. Both bodies are with one (Executive Board) and three members (Supervisory Board), respectively, dimensioned in a manner that warrants efficient discussions and work. Therefore, the establishment of committees – at least at the moment – does not promise any advantages. In accordance with the recommendations of the German Corporate Governance Code, the remuneration of the members of the Executive Board and the Supervisory Board are disclosed on an individual basis. The general rules of the remuneration system and the remuneration itself are more specifically referred to in the Remuneration Report which forms part of the management report (pages 65 et seq). Pursuant to Art. 19 Regulation (EU) No 596/2014 of the European Parliament and of the Council of 16 April 2014 on market abuse (market abuse regulation) and repealing Directive 2003/6/EC of the European Parliament and of the Council and Commission Directives 2003/124/EC, 2003/125/EC and 2004/72/EC (MAR) (and until 2 July 2016 pursuant to section 15a of the German Securities' Trading Act (Wertpapierhandelsgesetz)), the members of the Executive Board and the Supervisory Board and/or persons closely related to them are obliged to disclose the purchase and sale of ZhongDe Waste Technology AG shares and related financial instruments without undue delay to the Company and the German Financial Supervisory Authority (Bundesanstalt für Finanzdienstleistungsaufsicht – BaFin) whenever the value of such transactions exceeds EUR 5,000.00 or more within a calendar year. In the financial year 2016, ZhongDe Waste Technology AG has not received any such notifications. The members of the Executive Board directly or indirectly hold in total 50.86% of the shares in ZhongDe Waste Technology AG. The members of the Supervisory Board do not hold any shares in ZhongDe Waste Technology AG. The annual consolidated financial statements (Konzernabschluss) as well as all quarterly financial statements of ZhongDe Waste Technology AG are prepared in accordance with the provisions of the International Financial Reporting Standards (IFRS) as applicable in the European Union. The individual annual financial statements (Einzelabschluss) are prepared in accordance with the German generally accepted accounting principles and the statutory provisions of the German Commercial Code (Handelsgesetzbuch). The sole basis for the profit distribution is the individual annual financial statements prepared under the German Commercial Code. The individual and consolidated financial statements are prepared by the Executive Board. The audit of the individual and consolidated annual financial statements is devoted to the auditor elected by the general shareholders' meeting. For the financial year 2016, the general shareholders' meeting of the Company held on 28 June 2016 has elected Warth & Klein Grant Thornton AG Wirtschaftsprüfungsgesellschaft, Dusseldorf, as auditor of the Company and the group. The individual and consolidated financial statements as prepared by the Executive Board and audited by the Company's auditor are reviewed and approved by the Supervisory Board. At ZhongDe Waste Technology AG compliance, i.e. measures to ensure adherence to statutory provisions, internal statues and Company policies, is a key management duty. The Company has developed internal rules as well as a code of conduct through which all individual employees of the Company and its affiliated entities are obliged to comply with all statutory provisions and the rules set forth in these internal guidelines. The Company puts great emphasis to fully comply with both German and Chinese statutory legal provisions and conventions. Good Corporate Governance includes dealing responsibly with risks. The Executive Board keeps the Supervisory Board timely and duly informed about existing risks and their development. The Supervisory Board regularly deals with monitoring of the accounting process, the effectiveness of internal control, risk management and internal auditing systems as well as monitoring the auditing of the financial statements. The internal control, risk management and internal auditing systems are continuously evolved in order to meet the changing conditions. More details of our risk management system can be found in the management report. 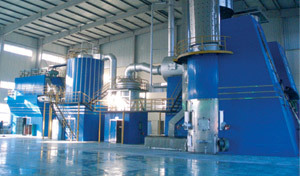 Our investors and shareholders as well as the interested public domain are provided with information on ZhongDe Waste Technology AG and ZhongDe Group as well as on major business events particularly through financial reports (annual reports and quarterly reports), balance sheet press conferences, analyst meetings and press conferences, press releases, ad hoc notifications as well as other notifications required by law. All this information is published in German and English. In addition, our shareholders are provided with respective information at general shareholders' meetings. The financial statements, ad hoc releases and notifications on directors' dealings as well as press releases can also be viewed on the Company's website at http://www.zhongde-ag.com/investor_relations/. All shareholders and interested parties can subscribe to an electronic e-mail alert on our website or directly get in touch with us.